High temperatures today reached the lower 30s with cloudy skies and scattered snow showers midday. Highs in the lower 30s will repeat tomorrow, then colder air will move in briefly on Friday. A round of snow showers currently across the Upper Peninsula and northern Wisconsin will move into Northeast Michigan tonight. Following that, a cold front currently near the Canadian border is producing an extensive area of light snow, and will drop southward into our area tomorrow. Low temperatures overnight will drop to the lower and middle 20s. Highs will reach the lower 30s with snow showers moving through, mainly during the morning and afternoon. Any snowfall accumulations should remain light, generally less than 2 inches. 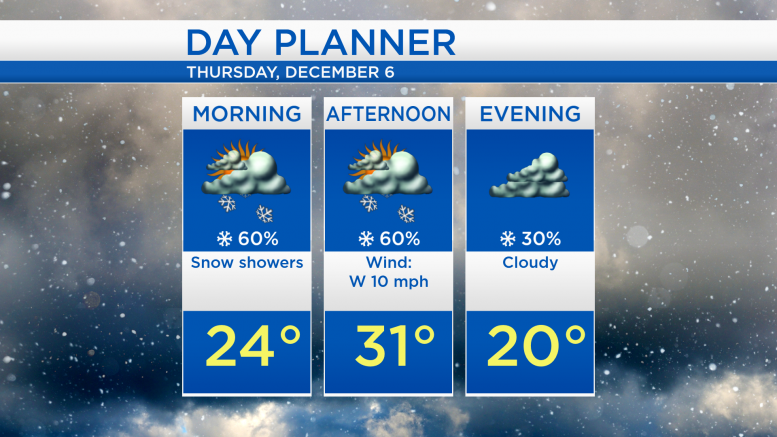 For tomorrow, highs will reach the lower 30s with some snow showers just ahead of an incoming cold front. Behind that cold front, colder temperatures will follow on Friday — early morning lows will start in the teens, then afternoon temperatures will reach around 24 degrees with mostly cloudy skies and a small chance of isolated flurries. Brighter skies will move in this weekend, a mix of sun and clouds is expected on Saturday as high temperatures rebound to the lower 30s. More sunshine and milder temperatures are forecast for Sunday. For the rest of Northeast Michigan’s weather forecast, watch the latest weather video by clicking the weather tab at the top of the page.